There is substantial clinical evidence published in peer reviewed medical journals that laser therapy (LLLT)/Photobiomodulation Therapy can stimulate repair of tissue, reduce inflammation and relieve pain in musculoskeletal disorders. Other applications such as shingles, post operative pain, also respond well. THOR specialise in the manufacture of hand held laser therapy devices for qualified doctors and therapists specialising in musculoskeletal pain such as Osteopaths, Chiropractors, Physiotherapists and Physical Therapists. We run training courses, support research, participate in all the key conferences in the field of cold laser. Shows you which probe, what settings and where to treat. If you cant find a treatment protocol you need, we will write it for you. We run 24 training courses in the USA, 24 in the UK and 6 in Australia every year and is approved for Continuing Education Credits in the USA. Laser and LED beams of light can stimulate the cells in the body that repair tissue, reduce inflammation and transmit pain. Light can stimulate or inhibit cellular function according to it's intensity and the time applied. Lasers and LED's produce intense beams of light at specific wavelengths. When the right wavelength at the right intensity is used at the correct anatomical location for the right amount of time you can stimulate repair, resolve inflammation and reduce pain. In addition, high intensity single point lasers can release trigger points and treat acupuncture points instead of needles. Once you understand these mechanisms and their subsequent physiological effects LLLT / Cold Laser becomes a powerful tool. 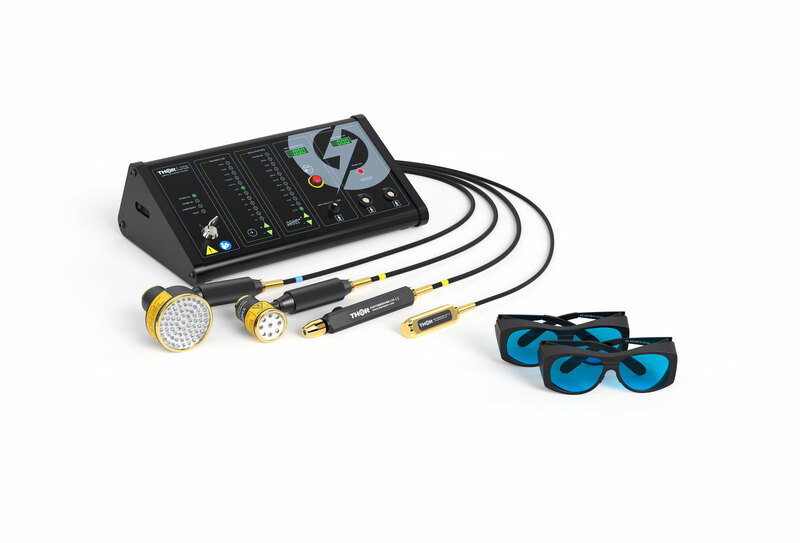 We hope you use your laser extensively and create great value for patients and your practice. "I have really been enjoying using my laser. I find it easy to use and compact. I like the fact that it is very mobile so that I can easily use it on home visits. I have had success with acute lower back pain, pain relief from, eg broken ribs, lymphoedema, and pain associated with chronic ulcers. I have set up my whole business on the use of this laser, and also Manual Lymphatic Drainage as I like to maintain some hands-on contact, and the business is building up very nicely." "We love this unit so much we just ordered a second one to keep up with demand! I've waited a while to purchase a unit. I really love this one! Fabulous engineering. Super simple to use. Thanks!!!" "Fantastic treatment system. Every GP should have one. Cost effective for patient and doctor." "I have been using Thor Laser in my clinic with amazing results! Many people called me after a news segment aired wanting to know more about the Laser and how it can help with their chronic pain. Big thanks to THOR Laser Photomedicine for creating this piece of medical equipment which has bought a lot of relief to many of my patients that have been using it. Everyone wants a speedy recovery, to get better fast, but not every intervention can work this fast! I am glad to help them improve their Quality of life." "I have used my Thor laser for about six months. The improvement in patients pain and rapidity of healing is substantial. This laser is on many times each day and is a mainstay for any traumatic treatment that we must do as well as an aid for a patients chronic pain that, many times, patients were told that they must live with. I would no longer feel comfortable practicing without a good low level laser. The Thor unit is definitely the 'big boy' of LLLT." "We just purchased our unit and am very pleased with the product. It is in use throughout the day. I always have questions! Your support is great answering my queries quickly and backed by science. Which is largely why we chose your product over your competition. I hope to see Thor presenting at more major veterinary conferences. We need to know the science!" See previous edition. Please add me to the monthly THOR training, research and conference Newsletter. There are now over 700 Low Level Laser Therapy (LLLT) clinical trials (RCT's) published in peer reviewed journals, 64 of which are for musculoskeletal pain including low back pain, tendinopathies, neck pain and osteoarthritis. These studies find that the median magnitude for pain relief is at least twice that of NSAIDS. There are 16 RCT's for just neck pain alone, a pathology for which no drug is currently licensed. There is increasing desire from patients to find a pain relief modality that does not involve drugs. The government and healthcare providers are under pressure to save money and practice safer, more effective evidence based medicine. LLLT could be the answer everyone is looking for, especially the patient. PainTHOR is for the medical doctors who want to prescribe less pharmaceutical analgesics whilst providing improved pain relief their patients need. THOR will supply the right product, training and a protocols manual for your staff to be successful. Treatments focused on the key injuries and pain syndromes that walk into your practice every day.